1. Tell us about the relationship between DKNY and Al Yasra Fashion. How has it evolved during the years? The relationship between DKNY and Al Yasra is one of the best. DKNY has always had a strong presence in the region and a very strong and loyal customer base. GIII Apparel Group are the new owners of DKNY and bought the brand from the LVMH Group in 2016. They have a vision to re-focus their energy on the DNA of the brand as it used to be. We have a very strong relationship with GIII on multiple levels – we work closely together on product development, purchasing, marketing, product assortment and product categories. They are a wonderful partner and that’s why we are successful as we both understand each other’s strengths. What makes the relationship especially strong is constant, mutual education about the region. We want to make sure that GIII as new owners understand all the regional nuances and intricacies as we are there regional partners in the whole GCC region. As partners we have to take into consideration the detail of customer profiles and demographics within each of the territories that we represent. We have 32 stores in the region for DKNY. There are 16 accessories-only stores and the other part of the portfolio is the stand-alone ready-to-wear full concept stores. KSA represents almost half of our total market and has historically been the strongest market for DKNY – in fact that is where DKNY launched in the region as the first global franchise over 20 years ago. We are also opening our first ever stand-alone sports concept store in Kuwait at the beginning of 2019. 2. DKNY is one of Al Yasra’s flagship brands, what do you find the greatest strengths of the brand in the region? The greatest strength of the brand is its heritage and the biggest objective of GIII and Al Yasra Fashion is to recognize the potential of that. That is why, as partners, we work closely together to ensure that all of that history is reflected into the brand. DKNY has always been ahead of the game in terms of innovation, contemporary materials, layering and urban sensibility. DKNY was also one of the first brands to introduce the concept of merging active wear with ready-to-wear. This is very much in line with today’s trends and the desire of the modern consumer. 3. 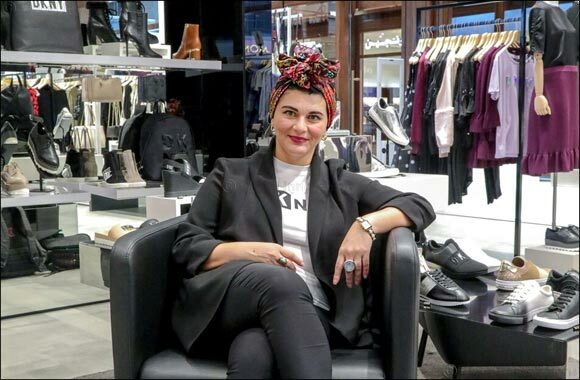 What is your vision for the future of DKNY and Al Yasra Fashion? What will be the defining themes? The brand has tremendous potential in all of the geographies in GCC. E-commerce is a very important focus for us. Having that platform to speak to the customer allows a 360 approach to how we engage all of our consumers with the right speed, at the right time, enabling a much easier omni-channel experience. We want to be available to our customer anytime, anywhere. We are also looking into strengthening our wholesale distribution. There’s a lot of untapped potential – this is just the beginning! 4. There are some exciting new launches coming up – could you tell us something about them? In the past few years, we have been launching Middle East exclusive Ramadan collections, introducing ready-to-wear, accessories and footwear tailored to the local taste and appropriate for that time of the year. Every year, we try to make the collection bigger, better and stronger. We constantly learn more about the colors, textures and the direction that our customer loves and we mix that with the DKNY brand aesthetic and local traditions. Following the success of the Ramadan collections, we are also going to expand the concept further and work very closely with DKNY to design a wider Middle East collection. We are not only going to have the one-time seasonal product but ranges that are continually available to our customer, taking into account the cultural preferences. We are launching a beautiful Resort Collection that will be available in stores mid-December. It will be all about glamour and sparkle, in line with the season and keeping in mind the requirements from our customers with feminine, strong and clean designs. That is a key launch for us, going above and beyond just the Ramadan or the Eid collections. We will continue to introduce these exclusive Middle East collections within ready-to-wear throughout 2019. 2019 is a very exciting year for us product-wise because we are showcasing collections that are very much about the local customer profile but absolutely within the brand DNA of DKNY. We are seeing a lot of other brands starting to move towards this concept in the region and it’s a smart approach. 5. You have been the CEO of Al Yasra Fashion for just under 2 years. How would you describe yourself as a CEO? What are the biggest challenges in leading a group of over 60 brands and 270 stores across the region? I have a unique sensibility in both the commercial and creative aspect. Half of my 25-year career has been in the brand creative direction and design side, and the other half in the commercial & financial side senior executive and CEO roles. That is incredibly unique as it allows me to understand and strengthen brand relations in any role that I take on. I understand the brand expectations as I am very much a brand-centric person and always working towards brand integrity while also driving performance and making sure that we capitalize on all commercial elements. So as a CEO, I wear both hats! When I am asked about challenges I always say that with challenge comes great opportunity. It is all about how you embrace and translate them into solutions. We are blessed to have a diverse portfolio which keeps our business dynamic. Al Yasra Fashion has three separate divisions, Watches and Jewelry, ONTIME, a regional retail leader in fashion watches, Premium Fashion, which represents brands such as The Max Mara Group, Kenzo and Jimmy Choo, and Fashion & Footwear with hero brands like DKNY and Cole Haan. We have to always stay ahead of the game and be relevant. 6. What are your plans for SS19? What do you think are the themes to watch for 2019? It is interesting when you look at trends, fashion is a cycle. We always tend to go back to the past. The 80’s has been a huge trend and on a personal level that has been very special to me because I am an 80’s child. It is reminiscent of my youth. We see palettes of icy and pastel colors and metallics making it clean and contemporary, an interesting mix of nostalgic trends from the past with a very contemporary vibe. Trends for me are something that are always an indication because in the end of the day the customer always dictates what the trend really is. The brands will bring a number of things to the table and what becomes a bestseller becomes a trend. Today more than ever social media influences this greatly – something you think is not a trend sometimes becomes a huge success if somebody important or influential wears it. Very interesting times we live in! 7. What are the important things that make any business successful? Having a customer centric mindset, where the customer is always number one and investing in your talents and teams as they are the ambassadors of the business.